What do clients want from your marketing agency? I'm sitting next to one of my sales reps. She is talking to a prospective marketing agency partner. She's talking about delivering ROI to clients. They asked, "But how do we know what clients want?" She said, "We ask them." They say, "But sometimes, they want to talk about impressions and rankings. So, that's where we focus" She said, "In my experience, companies care about revenue even when they say that they care about other metrics." To most people, that'd sound like a silly conversation to have unless you know that most agencies don't know a) how to help clients generate new customers and more revenue from existing ones b) know how to measure their impact on revenue directly. I even had someone tell me the other day that their clients are unwilling to share that information with them. I explained that we sell that as a feature; and strong agencies do too. Is your agency still guessing the impact of your work? As you can see above, six years ago, I posted a page about how we should sell the role of 'landing pages, calls-to-action, analytics' as tools to help companies generate leads. For those that haven't been paying attention, we did do that. We've been helping companies improve lead conversion rates for a long time. Most companies still don't know how to do 'online lead generation' effectively. In fact, most companies convert only 1% of their visitors into leads. Companies that do 'online lead generation' effectively convert 2-5% of their visitors. Companies that do inbound intensely - like HubSpot - turn 7-8% of their visitors into leads. 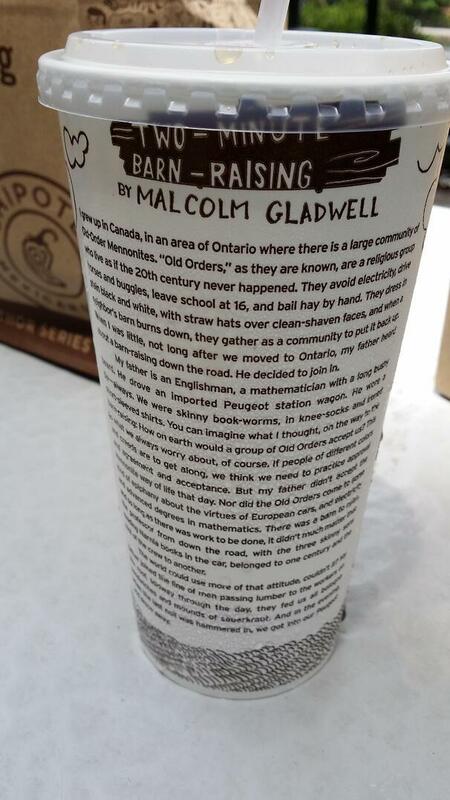 Content Marketing on a Soda Cup? There is one word that you should never use when someone asks you a question. It's "sure". Why? People often use this in response to requests. If the request came over email or chat, you shouldn't ever say "sure". Here's different ways that I (and I think a lot of other people) interpret it. It means you don't care. You don't really care about what they're asking you. You don't actually agree or want to do what they're suggesting. You're accommodating the person asking, but you're unhappy about it. You're not really saying "yes", even though you are. You're just flat out lying. What you really mean is "no". Other ways to handle a request instead of using "sure". Say "no" if you mean "no". Say "yes" if you mean "yes". Start by asking a question. Why do you ask? Why is that important to you? Disagree. If you don't agree, just tell the person. Make them explain themselves so that you're satisfied. Why Your Website is Your Dumbest Salesperson. Most of you didn't need to go read that article. You know that your website is like a salesperson and that you should invest in it. You know that buyers complete most of their buying process before they ever speak to your flesh-and-blood-type salespeople. Buyers do google searches, read blogs, ask questions on social media and hopefully (for you) they visit your website and read a lot about how you help people like them with interests, goals and challenges like theirs. You're already blogging once per day. You've comprehensively explained your service offerings on your site. You publish lots of case studies. You make sure everything is optimized for search and share-able on social media. In short, you're getting lots of prospective clients to your website; your website talks to way more people than your average salesperson does every day. If you're investing appropriately in these activities, your website is probably talking to more prospects than your whole sales team does every day. Your website might even be doing more than just attracting your prospects to you. It might be capturing information about individual prospects as they visit and revisit your site. (Kinda like a salesperson, right?) On your website, you might have lots of reasons for visitors to share their contact information with you in exchange for more information that will help them learn and make decisions - because you've built lots of offers and landing pages and are getting a high percentage of your website visitors to convert on your site every day. If you're doing all of this stuff, your website is by far the best 'business development representative' (BDR) you have. The average BDR makes 50 attempts per day and connects with 8 people. Your website puts the average business development rep to shame. Once again - if you're doing it all correctly and thoroughly - your website should be converting more people to qualified leads than your whole business development team does. Unfortunately, though, there are very few of you that are investing in your website's ability to sell effectively. Most salespeople are able to adapt to the prospect's situation and needs. They adapt the conversation if they're talking to a CEO vs a VP because the CEO will care more about the whole company and probably care a bit less about the details. Good sales rep adapt their conversation if they're talking to a VP marketing vs a VP sales since they have different goals and challenges inside their organization. Good sales reps adapt their questions and stories if they're talking to someone in one industry vs another. For example, you're not going to ask a higher-ed admissions person how their lead flow is - you're going to ask them how many applicants they've been getting. This is not easy to teach a salesperson. Your sales management team probably has to help your salespeople learn how to do this effectively. If your company is really on the ball, you've created different scripts, templates and training programs to teach your salespeople how to adapt to different types of buyers. But, chances are you haven't invested in your best salesperson! That's your website (just in case you forgot who I was talking about). Your website is probably your dumbest salesperson. Your website has the same damn conversation with everyone no matter who they are. In fact, while a good salesperson is having a handful of great 2 way conversations with different prospects every day, your website isn't having any. You wouldn't teach your sales reps to say the same thing no matter who they're talking to - why the hell do you set your website up to do it? 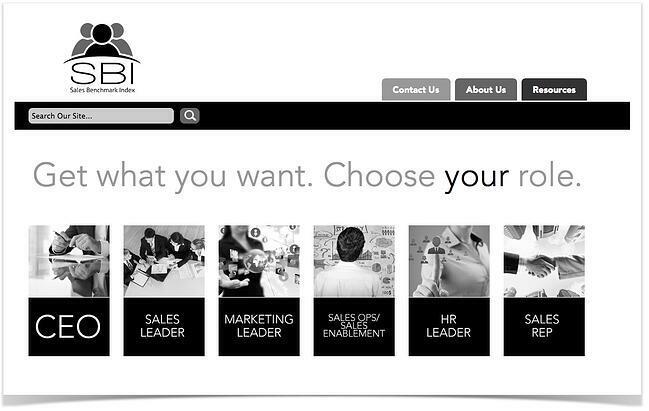 Examples of Companies with Websites Who are Their Smartest Salespeople. As you might expect, one of the smartest sales development companies in the world has a smart salesperson set up as their website. 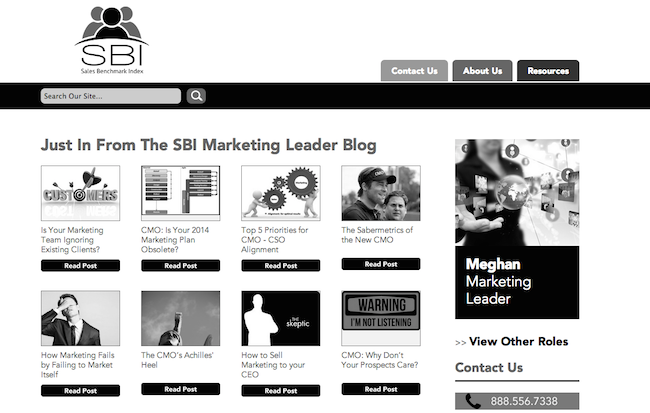 Sales Benchmark Index has implemented personalization on their website very effectively. They target larger B2B companies to help them improve sales and marketing effectiveness. As they target larger enterprises, multiple influencers and decision makers are often involved. In their marketing, they target CEOs, sales leaders, marketing leaders, sales operations, HR and salespeople themselves. As you can see in the screen grab below, they enable these different personas to personalize their website experience. You can see 3 more examples in an article written by Meghan called, "3 Examples of Website Personalization". 4 more examples here. While it's pretty hard to train a whole sales team on being great at adapting to different buyers, websites are pretty easy to train. You just have to write the content and write the rules. Here are a few simple steps. 1. Create buyer personas. If you sell to multiple industries, multiple people within a company or people with different situations, create as many buyer personas as you think you can and should target. At HubSpot, we have a bunch: small business owners, in-house marketers at SMEs, marketers at enterprise companies, marketing agencies, ecommerce companies, media/publishing executives, higher educational enrollment executives, non profit directors. Here's a free guide for creating buyer personas. 2. Think about what content you need to create for different buyer personas. You should probably start with one buyer persona first. Think about what content you'd need for different stages of their buying process. When they're in the awareness stage, you need to create blog posts like this one that point out that they're missing out on opportunity to do better. When they're in the interest phase, you need to create case studies. When they're in the decision-making phase, you need to create forms that offer a free consultation targeted at their needs. When they're in the action phase, you need to create pricing pages and pages describing your products and services. Here's a free guide that explains exactly how to do this. 3. Now that you have a matrix of personas and buying or "lifecycle" stages, start customizing your highly trafficked pages with content that speaks to these different personas at their different stages. For example, the text on your home page and blog sidebars should change. The calls to action on your product and services pages should change. You should highlight links to different content and have different forms asking different questions. Here's a guide (with videos) on how to implement smart content. Will Websites Make Salespeople Unnecessary Someday? Probably. Sadly (for the sales profession), we'll all probably buy complex products from some sorta robot (or algorithm) some day. I'd wager that the robots will be better than 99% of salespeople ever were. PPS. You can totally make your website smarter if you want. In the famous words of Lloyd from Dumb and Dumber. "Just when I thought you couldn't get any dumber, you go and do something like this... and totally redeem yourself [by creating a smarter website]!" And you thought the website design business was dead. We're just getting started. Was talking to David Weinhaus today. He's running a mastermind group for HubSpot partners. He has 20 agencies signed up for it. In the last call, he asked the group, "Do you thank your prospects for their time at the end of a sales call?" 90% of them said that they do. I suggested that he should tell them to say the following instead, "Thank you for your time today. Obviously, your time is more valuable than mine." (Yes, that's a joke. You shouldn't say that.) Unfortunately, when you thank prospects for their time, that is what you are implying. So, you might as well say it if you're going to continue selling the wrong way. Instead - if you want to sell the right way - you should make it a goal for your prospects to thank you for your time. (They should really be thanking you for insights and for making them envision a better future state for themselves. But, most prospects will never say that.) In sales, the prospect should always be receiving more value in a call than you are. (When they do buy from you, they should expect a significant return on their investment too.) There should never be a time when you're thanking them, even when they are clients. It should always be the other way. If you're delivering value, they should always be thanking you. As a baby step, stop thanking prospects for their time immediately. Also, when a prospect thanks you, you should say, "You're welcome." If you really want to do this right say, "You're welcome. What specifically was helpful for you?" If they can't tell you anything specific, then you're still not doing it right. But, at least you're not implying that your time isn't valuable. What most business owners don't realize is that internet marketing accelerates referrals and networking accelerates internet marketing. Buyers don't live in two different worlds: a world where they go online to learn about things and a world where they talk to other people about it. In fact, most buyers do both. Have I ever received a newsletter from a company that I forwarded to other people? Have I ever shared content online from a company I admire? Have I ever read content that someone I admire shared about a company? Have I ever been told about a company and then ended up signing up for their newsletter or following them on a social networking site? If my contacts are willing to tell someone about me in a conversation, would they also be willing to share my content with the people that follow them? If I have a larger group of people that follow me online, will they get to know me over time and be more willing to talk to me when I reach out (or meet them at an event or get introduced to them by someone who knows us both)? Getting referrals and doing internet marketing go hand in hand. Anyone that doesn't do both is missing out on new business. Now, before you roll your eyes at me and tell me that I could accomplish the same thing with a bunch of much cheaper tools from around the internet, just take a deep breath and let me explain. This statement is the equivalent of saying that instead of buying a Toyota Tundra, you can really accomplish the same thing with sheet metal, a set of wheels, and a couple of leather bucket seats. Could you feasibly build your own truck? Absolutely. But only a select few would have the know-how and patience to make it happen. And even then, there would always be annoying issues that just somehow make it not quite right. That’s how it feels to piece marketing software together: tedious, time-consuming, and annoying. And it only serves to distance you from your website, not connect you more fully. Piecing together marketing software sounds really smart after reading that, ha? This video (produced by Digital Third Coast) of Chicagoans answering the question, "What does SEO stand for?" is hilarious. When you hang out with people who know what you know, it's easy to forget that other people don't know what they hell you're talking about. Lesson: If you're marketing or selling something, remember to NOT asume that your prospects know what you're talking about. The selected candidate will have significant experience with HubSpot as they are in the process of moving from Exact Target to HubSpot. This is non-negotiable. Speaking of inbound marketing jobs, Dharmesh has been building up a bit of a concentration of them at inbound.org.